If the Catholic Church decides its needs an official backup for Jerome as the patron saint of translators (and in these times of tribulation, one cannot have enough divine help I suppose), Dave Turner of ASAP Traduction gets my vote. His CodeZapper macros for Microsoft Word have saved us so many thousands of hours of grief dealing with rogue tags in RTF and MS Word files, which screw up TM and termbase matches and make work very difficult, and other more recent contributions also offer useful support. He is the first one in my mind when I see a problem and think "There ought to be a macro for that!" Dave's latest contribution was part of an old discussion about preparing texts for translation in which the text to translate was marked by a highlight color. As I remember the original discussion, there were several highlight colors, and only one was to be chosen for work. Usually, if text of a certain color is to be hidden or shown in preparing a file for translation with a CAT tool which filters out hidden text, I use the search and replace function in Microsoft Word. That does not work for selecting a highlight of a specific color. You need to use a macro for that, and I no longer have the VBA skills to handle that myself. I can adapt a working macro, but no way I can manage a good one from scratch unless I spend a few days or more re-learning the skills of a decade ago. In MS Word 2003 and earlier versions, the macro can be created under Tools > Macros > View Macros. Name the macro, then click the Create button to paste in the code. The Run button will execute an existing macro if it is selected. In MS Word 2007/2010 the same functionality is accessed on the View ribbon with the Macros icon or Alt+F8. 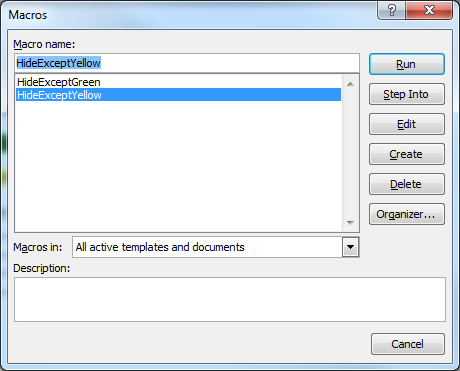 To adapt this for another highlight color, just rename the macro and change the designation of the color (wdYellow). The macro can be adapted to deal with combinations of highlight colors as well, and similar methods can be used to deal with text colors, though these can be handled by the search and replace dialog. I have just updated TransTools, a free suite of commands for translators, adding a new command similar to Dave Turner's called Hide / Unhide Text. This command offers a number of options to mark text as hidden prior to importing Word documents into CAT tools, or to 'unhide' all text in a document after the translated document is generated. You can "hide" text which is highlighted or "hide" everything except highlighted text, so it is well suited for most scenarios when preparing dual-language documents or previously translated documents with new text added. While Dave's command works well in most situations, it cannot process headers and footers, for instance, or text marked with several highlight colors. A detailed overview of this command is available at http://www.translatortools.net/word-hideunhide.html . Same here, macro hides everything it seems. Very impressed with this macro, thanks. Hi, landed on ur site through googling. I used the macro and followed the step by step procedure as shown in the youtube video. But when I run the macro all the text in the word document disappears - even the one that is not highlighted YELLOW. Any help will be appreciated. Thanks. By the way wonderful explanation and thanks again.